College News: Sunway College A Level Students Top in the World and Malaysia Again! 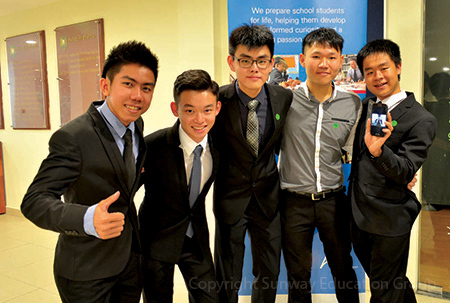 Sunway College A Level Students Top in the World and Malaysia Again! The recent Cambridge International Examinations (CIE) Oustanding Cambridge Learner Awards saw a total of 35 Sunway College Kuala Lumpur A-level students receiving outstanding awards for their achievement in the June 2015 examinations. 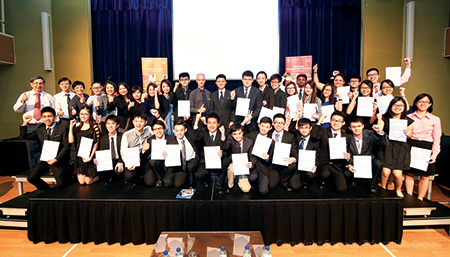 This is the second consecutive year for Sunway College achieving such impressive success. 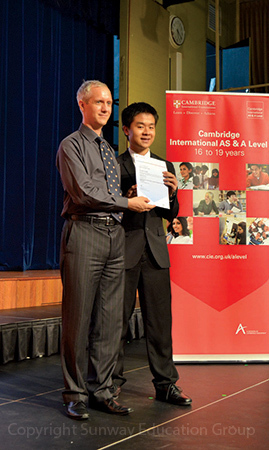 26 students were awarded Top in the World; 9 for Top in Malaysia and 1 for Best Across Four Cambridge International AS levels. 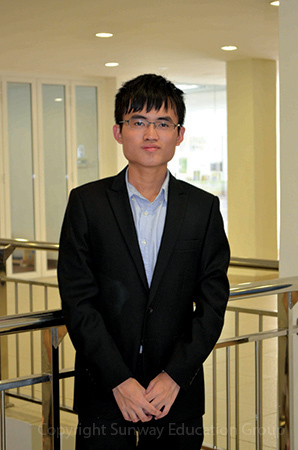 Mak Ming Jie was awarded Top in Malaysia for AS level Economics. 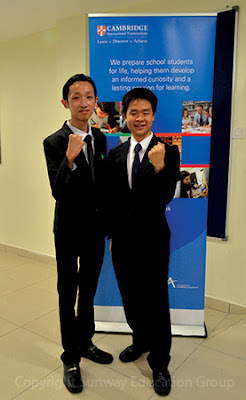 The young lad from Penang was delighted to receive the award. “A level was a daunting programme and Economics was a difficult subject as I was only exposed to this in A level.I am thankful to my lecturers especially Mr Nedumaran Munusamy (Senior Lecturer) and friends who have been very helpful throughout my time at Sunway,” said Mak who received a conditional offer from Warwick University and an invitation to attend an interview for University of Oxford. Sarah Koay Ci Hui who scored straight As in Mathematics, Economics and Psychology received Top in Malaysia for A level Psychology. “I’m very happy with my results especially for Psychology. I think I wouldn’t be able to achieve this without the supportive teaching at Sunway College,” said Sarah in presence of her proud parents Koay Chee Seng and Karen Kok Poh Tip. Asides from excellent academic achievement, Sarah who will be starting her degree in Bachelor of Psychology in February 2016 at University of Melbourne has also excelled in her co-curricular activities as she took over and led the Myanmar refugee project of the Sunway Student Volunteers Society. “I think she has become more mature and independent over the years at Sunway,” said Sarah’s mother. 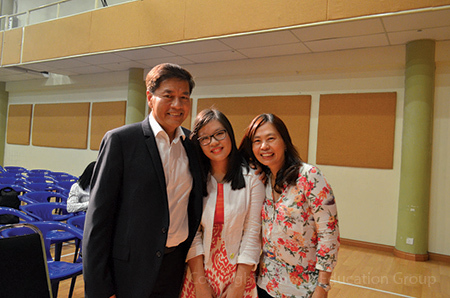 Coming all the way from Penang, the Dee family also celebrated Dee Ying Ling’s Top in Malaysia for AS level Chemistry at the awards ceremony. 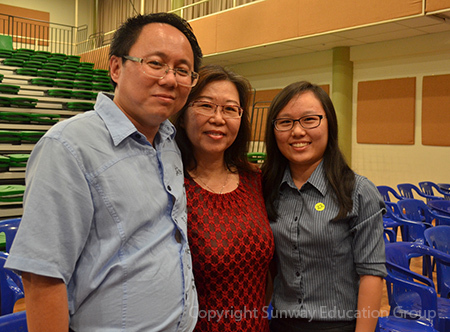 When asked why Sunway College was chosen, the family replied that it was the daughter’s decision but supported by parents Dee Chang Gin and Tan Siew Kim. “She had the KPM scholarship to choose her preferred college. We visited a few colleges in Selangor and were immediately attracted and assured by Sunway’s on campus security,” said the proud father, adding that he had no worry of her daughter’s safety at Sunway as all amenities, including bus transportation back home were safely and conveniently accessible via canopy walkways. Former International Mathematical Olympiad (IMO) winners were listed top in the World without surprise. IMO gold medalist Anzo Teh Zhao Yang and silver medalist Khong Yi Kye achieved Top in the World respectively for AS level Mathematics and A level Further Mathematics. Khong and his mother Ng Yew Looi also travelled far from Kedah for the awards ceremony in Kuala Lumpur. “My son has always shown great interest in Mathematics. 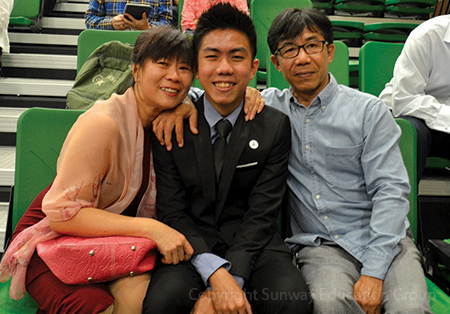 He has consistently exceeded our expectation and I am satisfied to see him perform outstandingly in this field,” said Ng, adding that his son without a doubt will continue a degree in Mathematics oversea. Currently Khong has applied to various universities in the UK and US. 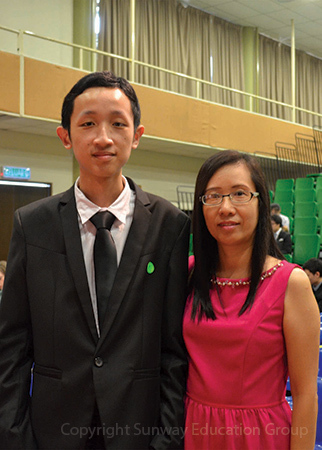 He has received an invitation to attend interview for Cambridge but his top choices are MIT and Princeton. 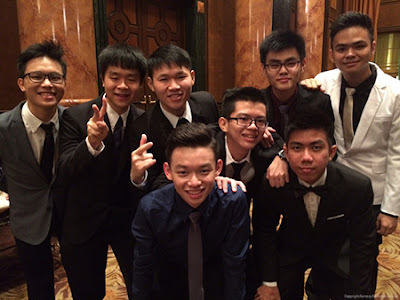 Interestingly, Anzo and 5 of his housemates received the outstanding awards for AS level from the CIE. Anzo’s housemates included Lim Yi Heng, Tan Hong Bin and Brian Kiing Chew Sian for Top in the World in Mathematics; Tan Xue Heng for Top in Malaysia in Biology and finally the pre-mentioned Kan Chang Yu. “There are 8 of us sharing a unit in Sunway Monash Residence (SMR) and it has been enjoyable living together. We had fun and we studied together,” recalled Anzo, adding that Zeno Lee and Kho Hou Yong, though were not listed in the Outstanding Cambridge Learner Awards, had also performed consistently well in A level. “There were so many funny moments we shared together. One instance was when we celebrated Xue Heng and Chang Yu’s birthdays which were just two weeks apart. We told them separately the idea of celebrating the other’s birthday, then we made them holding the cakes for each other. You may not be able to relate to the birthday ‘prank’, but it meant so much fun for us to see the two met in utter surprise with the cakes in their hands,” added Anzo with much excitement. Accompanied the students to receive the prestigious awards were the lecturers, including Amy who had been called many times on stage to receive awards on behalf of students who could not attend the event, and Lee Lip Seong. “I’m very proud of our students, they have never let us down and I trust that they will continue to shine in the future,” said Lee who helped arrange transportation to the event. 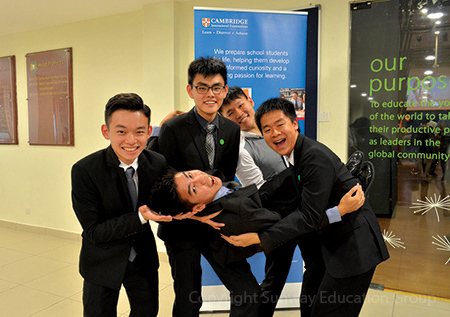 The Cambridge GCE A-Level Programme is one of the pre-university programmes offered at Sunway College since 1994. Sunway College is only one of three centres nationwide to be accorded the elite status of a Fellowship Centre. This status is accorded to a centre that provides a superior delivery system that produces excellent results in the biannual examinations.